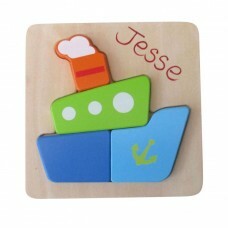 A range of wooden simple early learning puzzles, all products are available personalised in the name of your choice. 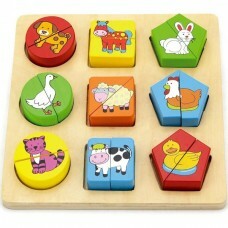 These chunky tray puzzles are available in 2 designs; farm and jungle. Each puzzle has 5 different chunky shapes, match the shape to the image underneath. A great early learning aid for developing hand to eye co-ordination and shape recognition. 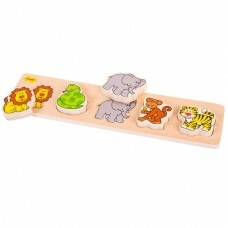 Age 1+ Size: 34cm long x 8cm wide x 2cm thick..
Great free standing wooden magnetic puzzle in either a farm or jungle design. Bright and colourful chunky pieces with hidden magnets to hold it together.Personalisation is hand painted on the base of the puzzleSize: 20cm long x 20cm high x 4.5cm wideAge 3+..
Brightly coloured chunky wooden puzzles for toddlers which are available in a car, boat, bear, aeroplane, butterfly or ladybird design. 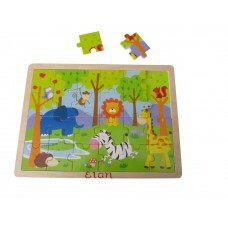 Each puzzle is made up of chunky jigsaw pieces that fit into a wooden tray. A great introduction to colour, basic shapes and helps develop finger motor skills.The names are hand painted as shown in the images.Size: 14.5cm x 14.5cm x 18mm thickAge 18mon..
A colourful geometric block puzzle in an animal design. The puzzle has 18 chunky pieces that makes up 9 different animals that fit into different geometrical shapes. Great for colour, shape and animal recognition, and also developing motor skills.The name is hand painted as shown in the images.Size: 20cm long x 20cm wide x 2.5cm thickAge: 18 months+..
A colourful geometric block puzzle in a vehicle design. 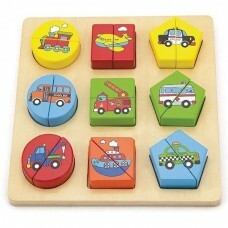 The puzzle has 18 chunky pieces that makes up 9 different vehicles that fit into different geometrical shapes. Great for colour, shape and vehicle recognition, and also developing motor skills.Size: 20cm long x 20cm wide x 2.5cm thickAge: 18 months..
A bright and colourful 24 piece wooden animal tray jigsaw. Add the jigsaw pieces with help from the same pattern shown underneath. 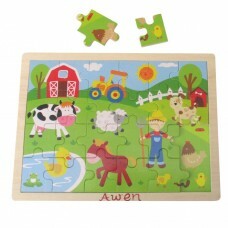 Promotes reasoning, imagination and helps to develop hand to eye co-ordination.Size: 27.5cm long x 20cm wideAge 3+..
A bright and colourful 24 piece wooden farm tray jigsaw. Add the jigsaw pieces with help from the same pattern shown underneath. 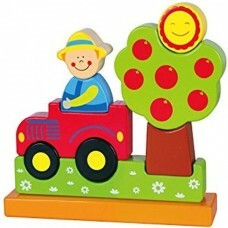 Promotes reasoning, imagination and helps to develop hand to eye co-ordination.Size: 27.5cm long x 20cm wideAge 3+..